Clean Leaning - Page 2 of 4 - ...in which I work towards a clean diet, make a lot of good food, some mistakes, and many silly comments. This was a winner! Wasn’t sure it was going to be so I didn’t take a lot of photos, but it was! I immediately inhaled two slices with fresh churned butter. Okay, fresh food-processed butter! Mix together all dry ingredients in a large bowl. In a separate smaller bowl, mix together wet ingredients except the pear. Peel and chop the pear in largish pieces. Add the wet ingredients to the dry and mix until everything is incorporated, but do not over mix. Add the pears in and fold carefully. Pour into pan, sprinkle pepitas over the top and bake for 45-55 minutes at 350 degrees. …but it is that magic time of year! It’s that time when all parents rejoice, all kids moan, and all teachers bid adieu to free time for a good month. With that and of course running a small business, add in a nasty case of the plague that was blessedly short but I’m pretty sure killed me (I got better) and I’ve been too busy to blog. See! Being haved! I’m still leaning into my clean eating lifestyle! I have a few recipes to post. One thing I am LOVING is overnight steel cut oats. The other thing is layered salads. I also have been using canning jars for a lot of things, including the overnight steel cut oats, the miniature crisps (short pint jars, turned out PERFECTLY), and the layered salads for lunch. Tonight I made a healthy zucchini chocolate chip breakfast muffin for the volunteers of a race I help to direct. Figured I needed to use up the zucchini. I needed NOT to have copious amounts of baked goods lying around, and I needed to show my appreciation. They turned out awesome so I hope they like them! So since I’m trying to eat clean, but haven’t had time to come up with something to replace my afternoon granola bars, I’ve not been packing them for lunch every day. So throughout my day (I tend to eat every few hours so I bring a lot of food) I’m eating fruit, a salad for lunch with some lean protein or some soup, carrots or other raw vegetable snack, and water and an apple on the way home. I thought I’d be starving for my run in the afternoon, but I’m not at all. I feel really good about it and if I am hungry, I have a slice or two of homemade bread when I get home. I think the main time I tend to stumble is when it comes to being so tired and headachy that it’s hard to choose food. Unfortunately with the change of weather I’ve had worse headaches lately. Very tiring. It isn’t that I throw all caution to the wind, but it means I need to take advantage of the good times and have food ready for the rough times. Here is the hopper with wheat berries in it. I did it. I decided that I liked my fresh ground wheat flour so much, I wanted to buy a real mill so I did not kill my almost 50 year old Vitamix. I got that Vitamix, by the way, off Ebay for $125 and it has been a workhorse! So if you find a deal on a used Vitamix, JUMP ON IT! They really are so well made. So I used my money from the sale of my iPhone 4s and got me my mill! 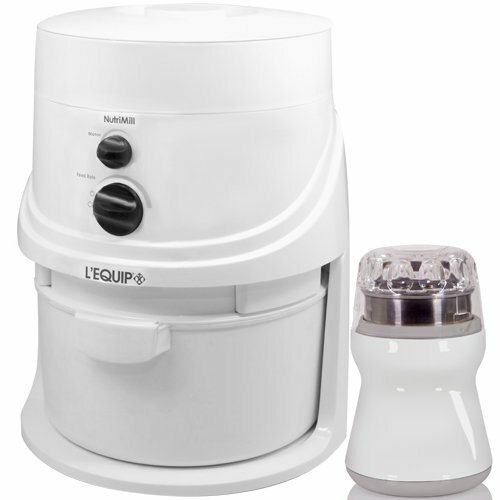 It is the Nutrimill Classic Grain Mill. I ordered it from Amazon after MUCH research. Love it. So far I’ve baked a number of loaves of amazing bread. I have used hard red wheat for the breads, and soft white wheat for pies and pizza dough. I just got in some hard white wheat so I’m going to do a few loaves with that today. If you get it from Amazon it includes a free smaller mill for things like flax seed.